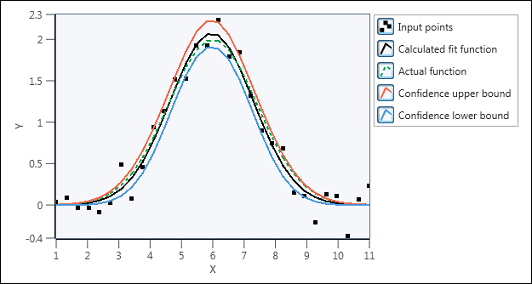 Calculates the confidence interval of the best Gaussian fit for an input data set. If the noise of y is Gaussian-distributed, you must fit the observations with the Curve Fitting (Gaussian Peak) node using the least square method to obtain the amplitude, center, and standard deviation. Level of certainty for the confidence interval. confidence level must be greater than 0 and less than 1. Default: 0.95, which means the probability that the best fit falls between lower bound and upper bound is 95%. Dependent values. y must contain at least four points. Independent values. x must be the same size as y.
weight must be the same size as y. The elements in weight cannot be 0. If an element in weight is less than 0, this node uses the absolute value of the element. If you do not wire an input to weight, this node sets all elements in weight to 1. Amplitude of the fitted model. Center of the fitted model. Standard deviation of the fitted model. Upper bound of the confidence interval. Lower bound of the confidence interval. Confidence radius of the amplitude of the fitted model. Confidence radius of the center of the fitted model. Confidence radius of the standard deviation of the fitted model. In the following illustration, the region between the upper and lower confidence bounds is the confidence interval.